Troy Rosasco, Senior Partner at Turley, Redmond, Rosasco & Rosasco, LLP has been selected for the 2018 New York Super Lawyers List. No more than five percent of the lawyers in the state are selected by Super Lawyers. Troy Rosasco, Senior Partner at Turley, Redmond, Rosasco & Rosasco, LLP has been selected for the 2018 New York Super Lawyers List. This is the fourth year Troy has been so honored, being named in 2014, 2016 and 2017. No more than five percent of the lawyers in the state are selected by Super Lawyers. “It is a great honor to be listed again. The fact that my fellow attorneys in the Bar have recommended me for this recognition is quite humbling,” said Troy from his office on Veterans Memorial Highway in Ronkonkoma. Super Lawyers, part of Thomson Reuters, is a rating service that selects outstanding lawyers from more than 70 practice areas who have attained a high degree of peer recognition and professional achievement. The annual selections are made using a multi-phase process that includes a statewide survey of lawyers, an independent research evaluation of candidates, and peer reviews by practice area. The result is a credible, comprehensive and diverse listing of exceptional attorneys. 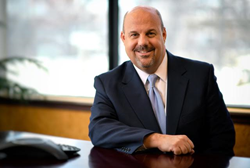 Troy has been with Turley, Redmond, Rosasco & Rosasco for 28 years and has been a board member on multiple national and New York State professional attorney organizations during his career. “I believe strongly that we have a responsibility to give back to our profession so that our clients always receive the best representation possible”, said Troy. His practice areas include 9/11 Victim Compensation Fund claims, Workers’ Compensation claims, Social Security Disability claims, and work-related and construction accidents. Troy is an Adjunct Professor of Law at St. John’s University School of Law where he teaches a course on 9/11 victim claims, workers’ compensation and Social Security disability. He recently completed a term as Chair of the Suffolk County Bar Association’s Workers’ Compensation and Social Security Disability Law Committee. Active in his community, Troy is a former youth soccer coach and a leader in his son's Boy Scout troop. He and his family reside in St. James. Turley, Redmond, Rosasco and Rosasco & Turley, Hansen and Rosasco are trademarks of Turley Redmond Rosasco & Rosasco, L.L.P. and Turley, Hansen & Rosasco, L.L.P. respectively.